The Compromise of 1850 goes down in many textbooks as a kind of high water mark for American statesmanship. Faced with serious threat to the future of the nation, the Senate came together under the leadership of elder statesmen Clay and Webster and averted a civil war. A decade later, other, lesser politicians would not match their epic triumph and so war came. The originator of the omnibus strategy, Henry Foote (D-MS), said as much outright. The facts do not bear that out by any measure save one: no civil war erupted in the 1850s. As I wrote yesterday, the compromise only entertained the full support of a tiny minority of Congress, which shifted its votes to support the demands of one section, then the other. By that time, Daniel Webster had left the chamber for a post in the Fillmore cabinet and Henry Clay gave up in exhaustion and left matters to Stephen Douglas. Of course, the men of the time did not know a war would come only a decade later. Nor did they then know their final settlement to preserve a Union half slave and half free would endure only four years. They did settle immediate and important questions: They admitted California. They resolved the Texas boundary dispute. 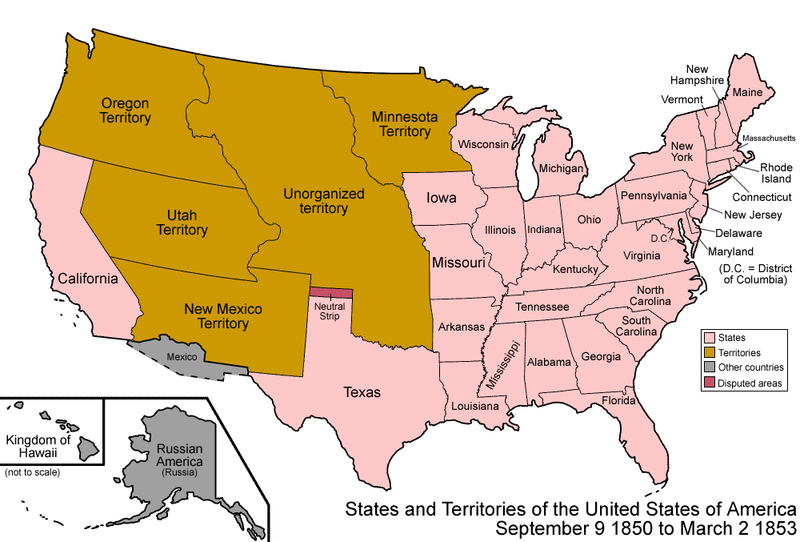 They gave territorial government to Utah and New Mexico. They gave the South at least a symbolic answer to its runaway slave problem and salved the North’s conscience by abolishing the slave trade in the District of Columbia. They surely believed in the finality of their settlement, as no more territory remained unorganized to dispute. The series of measures to which I have alluded are regarded by me as a settlement in principle and substance–a final settlement of the dangerous and exciting subjects which they embraced. Most of these subjects, indeed, are beyond your reach, as the legislation which disposed of them was in its character final and irrevocable. It may be presumed from the opposition which they all encountered that none of those measures was free from imperfections, but in their mutual dependence and connection they formed a system of compromise the most conciliatory and best for the entire country that could be obtained from conflicting sectional interests and opinions. For this reason I recommend your adherence to the adjustment established by those measures until time and experience shall demonstrate the necessity of further legislation to guard against evasion or abuse. At the close of the long session which adopted those measures, I resolved never to make another speech upon the slavery question in the halls of Congress. I regard all discussion of that question here as unwise, mischievous, and out of place. This entry was posted in Road to War and tagged California, Compromise of 1850, Fugitive Slave Act, Slavery, Stephen Douglas, The North, The South.